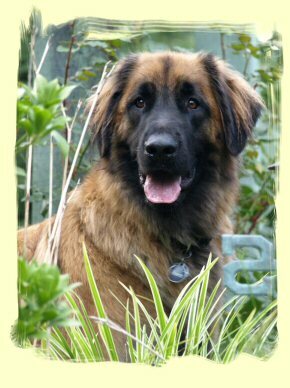 Ubert is a big, bold and beautiful 20-month old purebred Leonberger. He lives a carefree lifestyle, eager to greet everyone and anyone he sees. As he grew older—and bigger—this charming attribute became a problem, as he could not recognize when those around him were not ready or willing to be part of his generous greeting. As a young pup all was very endearing and our neighbours and friends loved his enthusiasm. However, as he grew larger we could see hesitation as we approached – just how much of a greeting would they have to endure this time? It became clear as Ubert moved past one hundred pounds that his energy and love of life needed harnessing. We tried classes and training using treats and found that in many circumstances no treat was better than the opportunity to greet (Ubert style). On outings, we tended to walk in the opposite direction when we saw people and their pets coming our way. We cautioned those we were unable to avoid that he was a very friendly pup and asked for their understanding of his overzealous outbursts. After a particularly disastrous greeting attempt I spoke with a friend whose dogs were in training with Sit Happens, wanting to understand what the training was about and why, if at all, was it different from traditional treat training. They highly recommended Sit Happens and their training programs, so we called for a demonstration. Early into the demonstration we could see a difference in Ubert. It was like he enjoyed the challenge of the training and the satisfaction of having tasks to perform—even if it was just sitting still. Ubert took some time adjusting to the boundaries being imposed and we have found verbal re-enforcement to be ever so much more powerful than treats. Ubert continues to be big(ger), bold and beautiful and when given the opportunity he will greet with all the enthusiasm he can muster.The difference is that he is able to restrain himself until we give him the play command. Ubert listens to us and waits for permission to play rather than playing and waiting for us to restrain him.